Who Really Depends On Whom? Question: How do the nations of the world force Israel to unite? Answer: As soon as Israel begins to advance correcting itself, immediately, due to their inclusion in all the others, through these channels, the Light begins to flow also to the nations of the world. Then, all the nations feel their approaching the Light and to the Source. And according to their internal nature of desire, this calms them. We need to understand that these desires of the fourth level are in a helpless state because they have just a need to be filled with the Light without any connection with It or ability to attract the Reforming Light. This dependence of the nations of the world on Israel is instinctively felt in the world more and more, depending on how Israel realizes its correction. This issue will become more important. In the next few years, it will be obvious that humanity will become more sensitive to the behavior of Israel. Attempts to be like everyone else and supposedly benefit humanity in the material world, making different inventions and discoveries, will not help Israel. This is not what is expected of it. Subconsciously, the world expects from Israel the connection to the Source of creation and will not exchange it for anything else. That is why, instinctively, there will be such calculations, and the friction between us and all our alleged friends such as the USA and others will increase. We cannot avoid this because precisely these states will show us our uncorrected state. We need to understand that it does not depend on them at all, but only on us, on how we will carry out our mission and follow the spiritual direction. By this we completely define in the fastest and most direct way, the attitude of the nations of the world towards Israel. Therefore, if our relations with the Americans deteriorate, it is caused only by our actions. If we see that our relations are consistently worsening day by day, we need to understand that we have to correct ourselves as soon as possible. The world is purposefully built in this way that Israel depends on everyone, precisely because in reality everyone depends on Israel internally. If Israel will do what is required—internal correction—then the world will leave it alone. But if we do not fulfill our obligations, but continue to be engaged in someone else’s work, then everyone will put pressure on us: the Creator from Above, and the world from below. Question: How is a true overcoming different from fighting our ego? Answer: It is impossible to fight our ego. Is it possible to fight our nature? You simply choose another desire, a greater one, in which that ego hides. It seems to you that you have overcome your ego, that you are fighting your ego with all your might. Suppose I want to stop smoking and overcome my craving for a cigarette. But at the expense of what do I do that? It means that I see some greater gain in that; it cannot be any other way. So eventually, everything is determined by a greater gain; it is the same ego. True overcoming is done in “faith above reason,” when I surrender to the group and through it attain the Light that Reforms, which operates on me and gives me the attribute of bestowal, takes me out of my ego, and raises me above the egoistic accounts. Question: What prayer is needed in order to overcome the interruptions? Answer: First, you must say His praise and then make the request. The request should also be in order to bring the Creator contentment. This means that there is a series of actions and desires here, that one is based on the other until they all line up in one chain. The Creator’s greatness, my worthlessness, and the request to give me the power to correct myself are connected in this chain since all that is the Creator’s work and not mine. All this is so that I can attain the corrected state that will bring the Creator contentment. When I arrange everything in one chain properly, I show how much I know and understand the process and to what extent I agree with it and want to be part of it. This is called my spiritual vessel. If all the desires, thoughts, causes, and results are arranged correctly, they make up such a prayer, like in the Siddur (the prayer book) that was written by Kabbalists. Thus, they give us examples of how to appeal in gratitude, in a request and in appreciation, to bring the Creator contentment, which means to build my vessel. The prayer is the building of the spiritual vessel. We don’t need more than that, but we should understand that everything is made by the Light, and so the request is demanded from us so that this action will take place Above. When we acquire the right vessel, we will be able to perform the actions of “to receive in order to bestow” with it. First we need the recognition of evil, its clarification, the desire to detach ourselves from it, and the request for correction. First we correct the state of “to bestow in order to bestow,” and then we attain “to receive in order to bestow.” All this is reflected in the order of the prayers in the Siddur that was prepared for us by the sages of the Great Assembly (Sanhedrin) even before the spiritual shattering. Question: How does the Returning Light expand Malchut? Answer: The vessel of Malchut is a tiny grain in which there is nothing. It is the smallest desire, an elementary particle with Reshimot (informational gene) inside. It is like a lifeless seed that only has the hope to come to life and that’s all. But when Malchut within this tiny grain, when the “microprocessor” begins to calculate how to react to the Creator, creating Returning Light in it, its reaction to the Creator, and in the Returning Light it begins to feel the Creator Himself. The Creator is revealed within this reaction. Then this Returning Light, the attitude of the created being towards the Creator, together with the attitude of the Creator towards him, which is now revealed above this grain, returns into the grain and expands it. Thus Malchut expands, and not only does it expand, but also takes on the form of the Creator. This form is dressed in the attitude of the created being towards the Creator. The two forms that are dressed in the desire expand it and give the desire the form called adhesion. So when a student wants to ask a question his own way and stay with it by getting an answer, it works well in an ordinary university where the professor lectures from the podium. You may or may not agree with his method of teaching, you may accept it or not accept it, but in studying the wisdom of Kabbalah it doesn’t work, because the teacher “formats” the student. The student takes on the form of the teacher, just as I received it from my teacher. This is the holy study. You can agree to that or not, but you won’t advance unless you receive it from me, even though you don’t like it now and it seems bad and distorted to you. Everything you receive from me can only be in my form and it must be dressed in you. This is the nature of the spiritual world, and there is nothing we can do about it; one form is dressed in another. This is why I insist that my students ask questions my way. It is the “formatting” of the soul; it is the mutual work of the teacher and the student with the upper help. Baal HaSulam, “Messiah’s Shofar”: And because of that, Rashbi permitted himself and disclosed the wisdom of the hidden in his books, The Zohar and the Tikkunim. However, it was with great care, since he only permitted Rabbi Abba, who could disclose with intimation, so only the sages of the children of Israel would understand, and the sages of the nations would not understand. A Kabbalist who attains the spiritual world is like a scientist who discovers something great. If you ask him to explain his discovery, he’ll not find the words for it and not be able to find a clear coherent definition. In order to do that, we need methodologists who pave the way for people to the summit of knowledge. So if we are talking about the first convergence, Rabbi Abba could rewrite the words of Rabbi Shimon so that they illuminate even for beginners, for those who are at the foot of the wisdom of Kabbalah, and help those who advance in the spiritual levels to ascend. He arranged the material in such a coherent way so that there can be a smooth transition from “grade to grade,” from one level to another. Even if an ordinary person wants something, like a baby who opens his mouth instinctively, that’s enough. After all, he already has a digestive system, which means that the food he receives from the great ones will help him grow. This is what Rabbi Abba knew how to do: to disclose with intimation, thus allowing even a beginner to approach the secrets. Rabbi Shimon attained the whole world, and Rabbi Abba knew how to bring his words down and to arrange them for our ascent. This is why The Book of Zohar is like a spiritual ladder for us. Baal HaSulam adapted The Book of Zohar even more for modern times through his Commentary on The Book of Zohar. We think that he added Kabbalistic terms, but it isn’t so, it’s something else. The additional explanations do not add anything by themselves. On the contrary, they can distance a person who wants to learn this book from the inner essence. This is because then a person simply fills himself with knowledge. No, Baal HaSulam eased our way even more so that we will hold on to it and advance by both the mind and our emotions. Kabbalists were worried and made sure to pave this path, the ladder, and to provide us access to it. Question: We too would like to disseminate the wisdom of Kabbalah in a clear envelop and at the same time with a “filling” that will advance people. How do we do that? Answer: It’s imprinted in us on the instinctive level because we study by the method Kabbalists passed on to us. A person who studies here and is dedicated to the path has it, thanks to the connection between Rabbi Shimon and Rabbi Abba. After all, everything stems from The Book of Zohar and only that spiritual root operated for all the generations: the upper attainment (Rabbi Shimon) and the path, the access to it (Rabbi Abba). All the other friends from Rabbi Shimon’s group, including his son Rabbi Elazar who speak about the end of correction, are incorporated in this system. So this is the meaning of “disclosing with intimation”: Even during the concealment, everything that a person needs is revealed on the way. This attitude appears in us towards the friends, teacher, and towards the Creator. But regarding the Creator, it’s hidden as long as you do not prepare yourself by working with what was given to you, that is, until you begin to see the friends and the teacher as great and big, and perceive those who are below as small, in need of your care. You find yourself in the middle, obliged to everyone! Baal HaSulam, Shamati #211 “As Though Standing Before A King”: One who is sitting at one’s home is not like one who is standing before a King. This means that faith should be that he will feel as though he is standing before the King all day long. Then his love and fear will certainly be complete. And as long as he has not achieved this kind of faith, he should not rest, “for that is our lives, and the length of our days,” and we will accept no recompense. Our main goal is to attain the Creator as if we stand before a King, not having even the slightest feeling of rejection when we get other types of various rewards from Him: knowledge of what’s written in the books, respect, honor, and other sorts of fulfillments. On the contrary, only the revelation of the Creator grants to us the wisdom of Kabbalah alongside its true implementation. This goal should constantly be in front of a man and nothing less than that! This is the only goal one should aspire for. Unless a person starts to sense the Creator, his ego doesn’t conform and it repeatedly confuses him thereby strengthening his ultimate goal. “One who is sitting at one’s home” means that a man is still inside his ego and doesn’t realize what exactly is going on, but rather sees the world through the prism of his selfishness. The world he sees is adequate to his level of egoism; it’s full of downsides that replace a picture of the authentic reality around him. The moment one exits “his home,” he discovers the King and attains Him; thus, he acquires the faith that corrects him. This is why the entire preparation period that we are currently experiencing is meant only to obtain the desire to reveal the King, the property of bestowal, to stay in this property and eventually exit our current “home.” This is the only goal we should aspire to! And What Would You Do In The King’s Palace? Question: How does it happen that, by improving ourselves, we correct the entire generation (as Baal HaSulam writes in his article, “600,000 Souls”)? 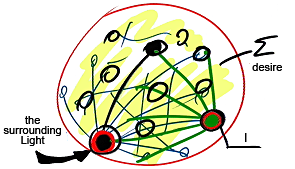 Answer: It cannot work otherwise in the integral analog system in which everybody is interwoven with one another. By correcting a part of me within the universal structure, I correct my connections with others, thus making all liaisons work one hundred percent properly. If I improve myself relative to someone else and continue working with them, it means that someone out there is also getting corrected. In other words, by self-correction, I alter the entire segment of the general structure to which I belong: the entire system of souls that are a part of my generation. This is the way one corrects the others and, thus, discerns a complete (general) soul from one’s personal perspective. So far, it’s not an ample perfection; it is called a “personal end of correction.” A man doesn’t correct himself, but rather his connections with and inclusion in the others. Hence, he corrects himself. Each of us senses himself as a detached entity only because of the shattering. If not for shattering, we wouldn’t exist at all. Instead, there would have been a network of connections among us. We feel alive only because the power of the shattering has created an individual self-perception within each given desire. However, through self-correcting—by including myself into others, by revealing the links that already exist among us, and by conforming to them—I lose myself. I transition to becoming a general liaison and, thus, “shift” into others. I am totally incapable of receiving into one point, in me. Only by including myself in others, I acquire their vessels and desires. I figure out exactly what I can give to my neighbors, to the person next to me, the one next to him, and so on to everyone! I discover my personal measurements of bestowal, and thus I win the entire space of the common soul. This is the only acquisition I get. The more I include myself in others, the more I gain through the mere fact of being together with them. It’s similar to having children. You give everything to them – yourself, your sperm—and thus you multiply and continue living in your children. My original “I” “discontinues.” It is present solely in my involvement with others. This is how I attain the common soul, all possible liaisons and contacts with others. Each one performs this kind of work, thus getting encompassed into others. This is how one attains the general common soul, but in one’s own unique way, according to one’s individual spiritual root. Then, one receives the entire sum of other people’s desires only for the sake of serving and fulfilling them. Thus, he becomes a channel through which the Light is transmitted to others. One receives the surrounding Light that Reforms, reveals others’ demands, and satisfies them. This is how he links with and serves others, similarly to a cell that attends to the whole organism, thus gaining the whole body. So, by saving our souls, we recover the entire world since a part and the whole are equal. If an isolated particle is connected with the rest of the system, then the whole structure cannot achieve perfection without it since one particle is as significant as the entire system. This is what the law of perfection of the analog system is about.